Although chickens are indeed resilient birds and certain breeds should endure cold rather well, temperature drops might produce some problems. Generally speaking, chilly weathers would interfere with the egg production and a couple members of the flock could fall sick. 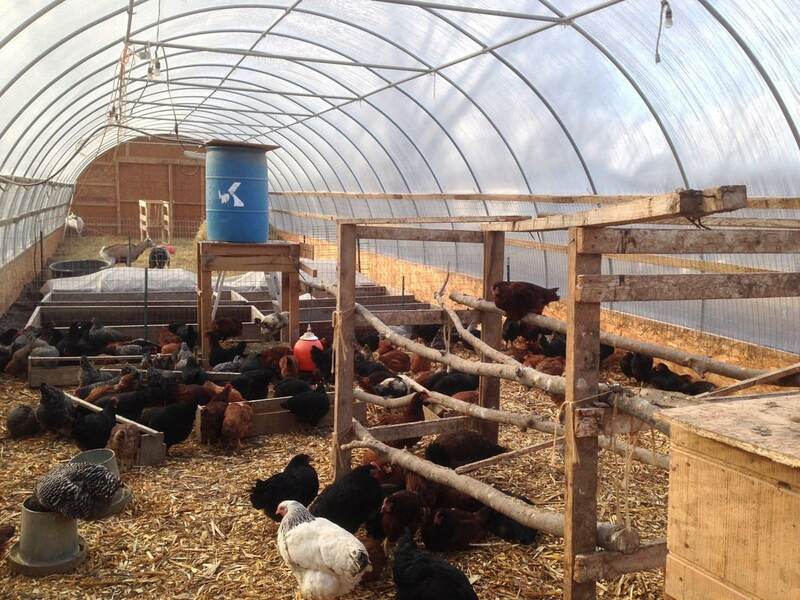 Many people rely on heating appliances such as heater and heat lamps to keep their coop sufficiently heated in winter. That being said, these appliances require a constant supply of electricity to work and fire is an ever-present threat. Therefore, farmers have been searching for a way to heat a chicken coop without electricity once the weather gets cold. You are a beginner at raising chickens and don’t know how to provide your chicken flock with enough heat? If that happens to be the case then you have come to the right place. 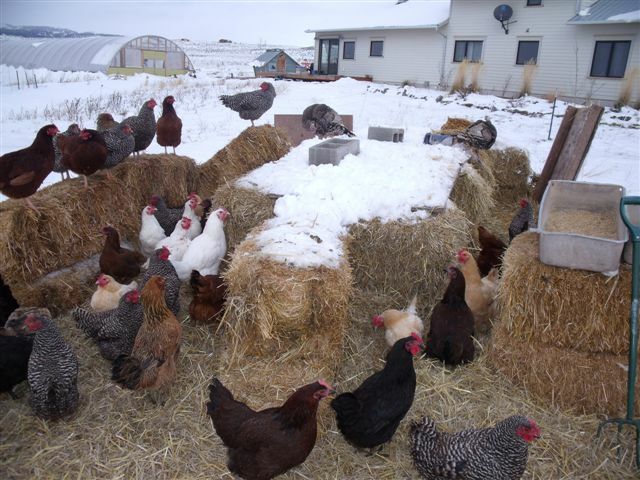 In this article, you would be introduced to some of the best methods to protect your chicken from extreme cold without using electric powered devices. From the principle straight to the execution, you could find pretty much everything you need to know right down below. Take a good look at the provided information and you would be able to keep the chicken flock reasonably warmed in wintertime with relative ease. While daytime is shorter than usual in winter, you could nonetheless take advantage of sunlight to deli liver much needed heat to the chicken coop. Large-sized, well-insulated windows should serve well as sun traps since they allow incoming sunlight to effortlessly reach the floor the of the coop. In order for you to get the most out of the sunlight, the coop floor should be made of materials like stone, concrete or compost. The materials act as thermal masses that accumulate heat during the day and then steadily release it throughout the night. It goes without saying that air leaks would accelerate the heat loss rate and that is why you need to seal all gaps and cracks. In the case the chicken coop you are using is relatively new, you should find few leaks across the surfaces. On the other hand, if the coop is fairly old, certain parts may already rot and you have to repair them as soon as possible. If you don’t have the patience to assess your well-used coop, it’s a good idea to replace it with a new one. Despite the fact that you have to protect the coop from cold air, it’s essential that you don’t limit the airflow too much. Once the air gets stagnant, the chickens would be vulnerable to ammonia build-up so be careful and act appropriately. For most of the time, it’s strongly advised that you outfit the chicken coop with an efficient ventilation system to keep the air moving. By doing that, the level of humidity in the coop should stabilize at an acceptable level and prevent the growth of mold in the bedding. Needless to say, it’s of utmost importance that you keep up the hygiene of the coop if you want the chicken to stay healthy. In case you don’t know, these birds release a lot of moisture through their breathing and poop which increase the humidity of the surrounding. 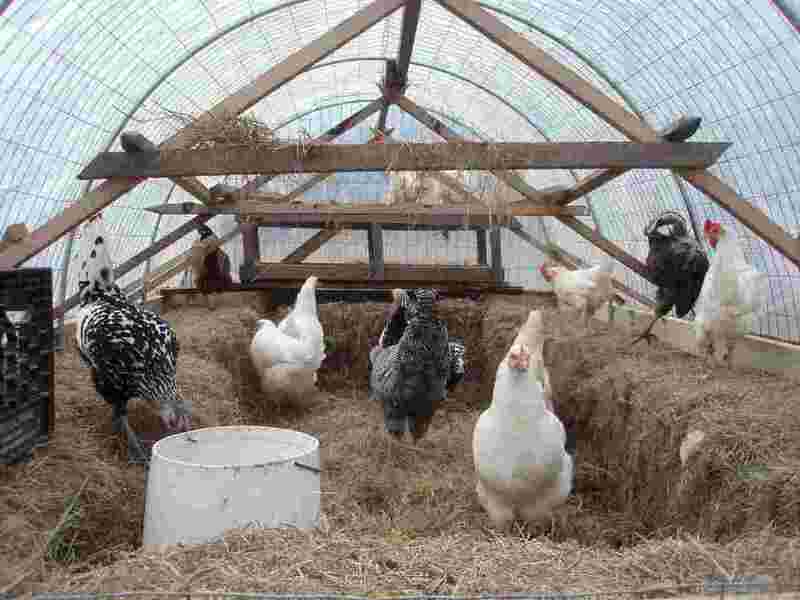 Without timely cleaning and tidying, the interior of the coop would get humid and frostbite could even become a fairly annoying issue as a result. In most of the case, you need to check up on the chicken coop periodically and see if you have to clean it or not. Don’t have the time to thoroughly clean the chicken coop? Then you should try out the Deep Litter technique. 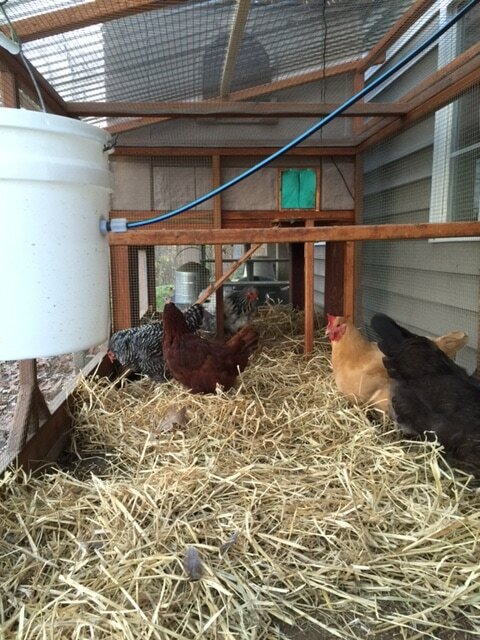 All you have to do is to spread pine shavings and other organic matters over the floor of the coop. Every once in a while, visit the coop and use a rave to stir the bedding before adding another layer of pine shaving on top. The shaving would take care of harmful bacteria in the chicken poops and it helps to insulate the coop too. Chickens often seek high grounds to sleep at night so you should construct a couple of roosting bars if you coop don’t have any. The flock normally roosts together and tends to flock their feather in the process which keeps them warm in cold weathers. 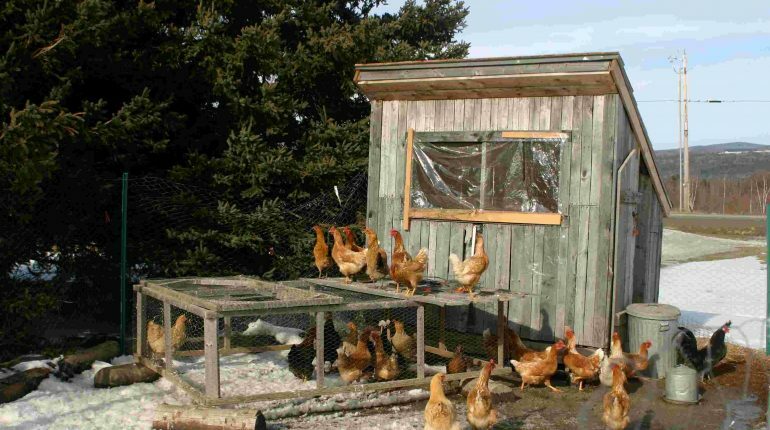 As standard roosting bars must be set up above ground for at least two meters, the chickens would not come into contact with cold surfaces. Take the number of chicken you currently have into account in order to create enough space on the roosting bars. In cold weathers, chickens prefer to hunker down inside the coop and a lot of people are also tempted to keep their birds locked up. Nonetheless, it’s much better for the chickens to be able to move freely so you should consider adding a sunroom extension to your coop. It’s quite simple to build a sunroom and it only requires easy to find materials such as clear plastics, some poles and so on. The sunroom would shield the chickens from incoming cold winds but still let the birds get around without much problem. Cooked pumpkin, cracked corns and similar foods would be excellent additions to the normal feed of your chicken in winter. It often takes a whole night for the flock to digest certain foods that they eat in the evening which naturally keep their body warm. Besides the foods, you should also make sure that every chicken of the flock has access to fresh liquid water. Once the temperature drops below freezing, the water dish of the chicken coop often freezes over which is not good. You could put a saltwater bottle in the dish to keep the water from freezing or bring water to the coop when you collect eggs.